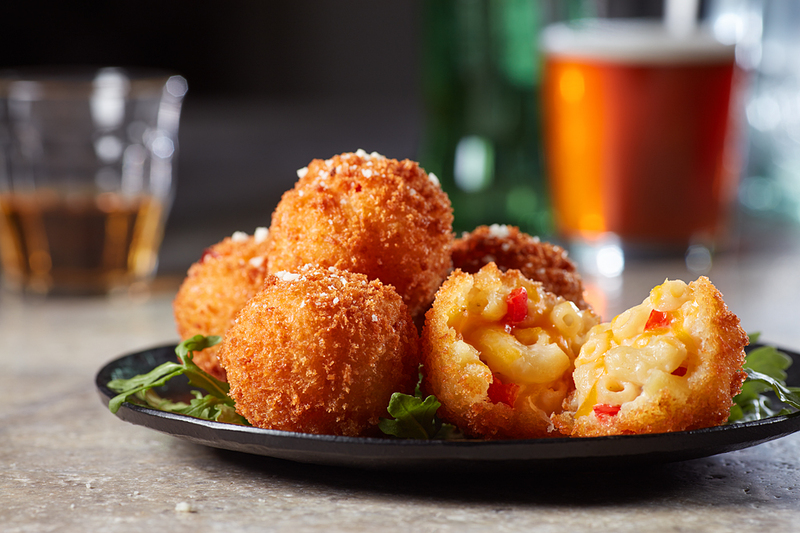 A comfort food classic turned into a delectable, cheesy bite with a hint of beer that is sure to be a game-day hit. Heat butter in medium stockpot on medium heat until melted. Whisk in flour; cook 3 min. whisking constantly, until light golden brown. Reduce heat to low. Slowly whisk in milk and ale, 1 cup at a time; whisk continuously until mixture is smooth and thickened. Add salt and spices; stir to combine. Stir in shredded cheeses; slowly mix until melted and smooth. Remove pot from heat. Add green chilies, pasta to pot; mix well and let mixture cool completely in covered hotel pans in cooler. Once mixture is chilled, use a #30 scoop to form 24 balls. Push one cube of cheese into center of each ball; seal completely. Arrange on parchment lined sheet pan and freeze 20 min. Place flour, eggs and panko crumbs in 3 separate bowls. Dredge balls in flour, dip into eggs, then coat completely with panko. Fry balls in batches at 375 degrees F 5-7 min. or until crisp and golden brown. Serve with ranch dressing or warmed Barilla Marinara sauce for dipping.